McGill signed new collective agreements with three units of the Service Employees’ Union Local 800 (Fédération des travailleurs et travailleuses du Québec) on Tuesday, Nov. 8. McGill signed new collective agreements with three units of the Service Employees’ Union (SEU) Local 800 (Fédération des travailleurs et travailleuses du Québec) on Tuesday, Nov. 8. The new agreements will be effective for five years. Members from McGill’s Facilities Management, Student Housing Services, Dining Services and the Faculty Club, as well as from Printing Services and the Data Centre had voted in favour of the new agreements in late September and early October. Together, these units represent some 360 McGill employees, such as service people and general help staff, cooks, counter persons, printing staff, mailroom staff and computer operators, among others. “Now we know we have a great working relationship for the next five years. I want to thank everyone who was part of these negotiations on both sides – the administration and the representatives of the unions – for coming together to create this harmony,” said Prof. Morty Yalovsky, Interim Vice-Principal (Administration and Finance). The groups’ last collective agreements expired in November 2012. Negotiations between the units and the administration lasted until May 2016, when an agreement was finally reached. “I think we have what is a winning agreement for both parties, one that will allow us to work better together”, said Jose Rego, President of SEU Facilities Management, Student Housing Services, Dining Services and Faculty Club. 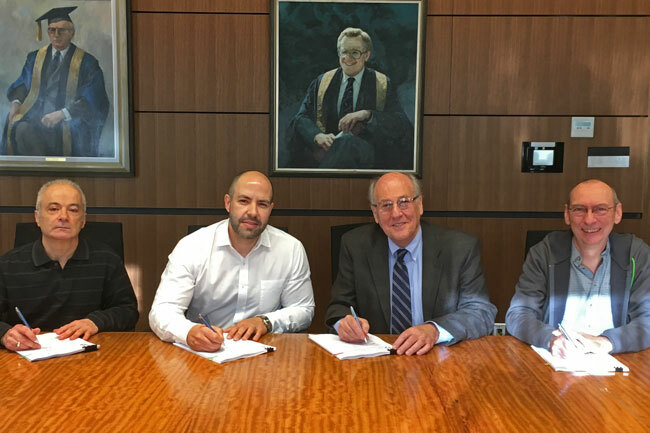 The signing of these new collective agreements concludes the latest round of negotiations with McGill’s SEU units. Last April, the University signed new collective agreements with SEU Trades (Downtown), the SEU Powerhouse (Downtown) and SEU Trades & Powerhouse (Macdonald) who together represent approximately 150 McGill employees. These three units signed six-year agreements extending retroactively from 2013 until 2019.